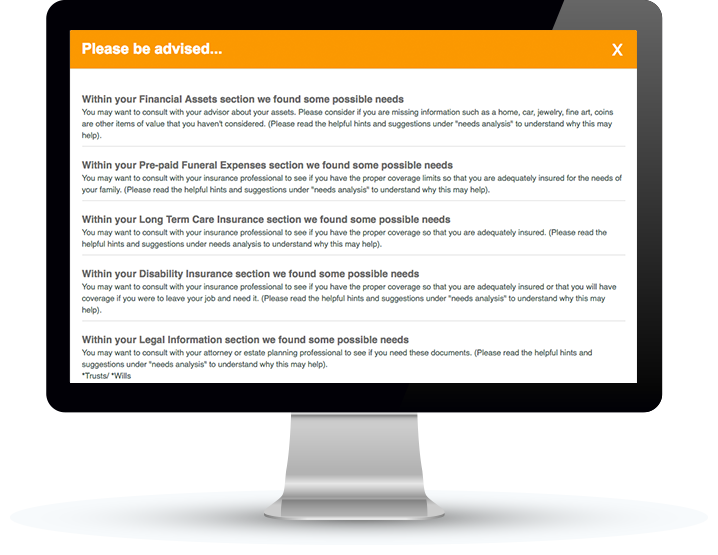 These features will provide you with valuable benefits for your practice, your client's planning and their beneficiaries. 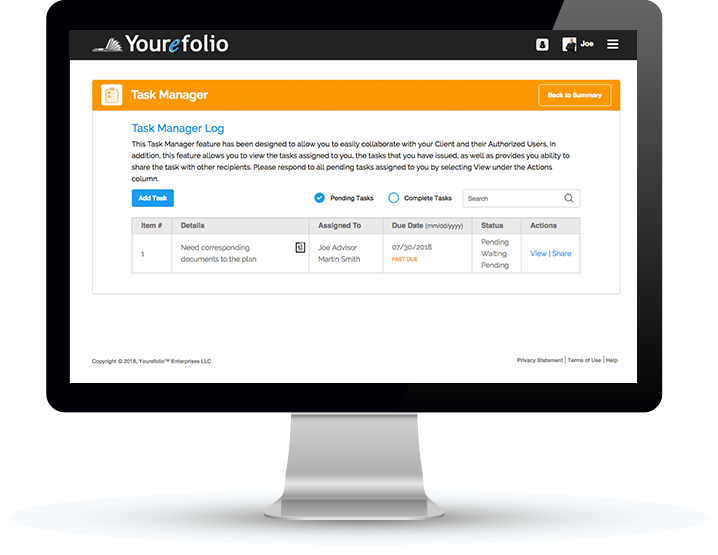 Explore for yourself how these various modules can make a significant impact by implementing Yourefolio into your business. 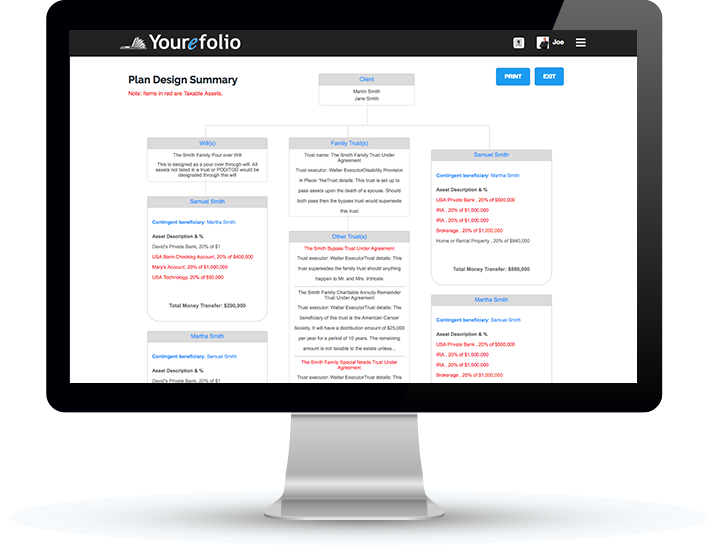 Drag and drop flow charts that are customizable illustrations on how an estate plan will look for your client. 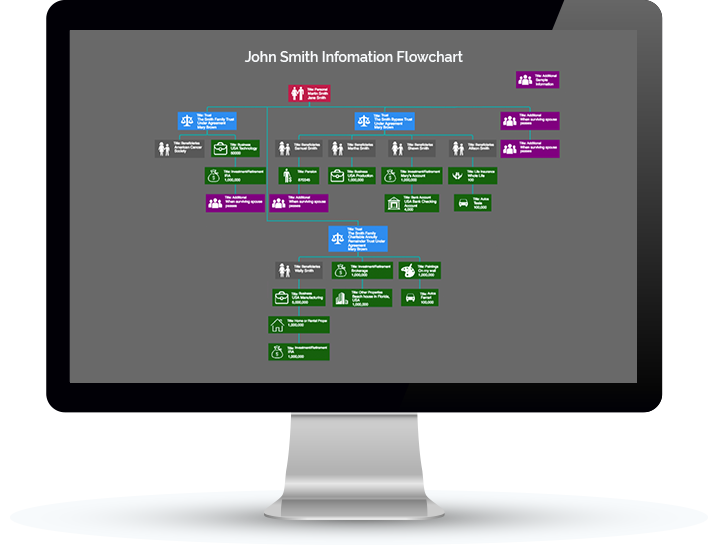 Our pre-populated drag and drop flow charts are an easy way to illustrate estate plans for your clients. Move boxes around, add language to an existing box, delete boxes and add notes to provide visuals that accompany the documents. Nimble and easy to use, print multiple options for more complex plans so your clients can see differences play out within their estate. Color coded and labeled for easy understanding. Know confidently that clients will have a better understanding of how their estate plan is designed and how their beneficiaries will receive the estate. An estate analysis that recognizes deficiencies and provides professionals with an idea of what may cause issues within the estate plan. Our estate analysis populates messages that notify users of items that may need to be addressed within the estate plan. From assets that may not be titled correctly to missing guardianship designations, this module will help professionals tighten up any estate plan. Clients can now view the same messages making it a less intrusive conversation. Custom plan designed summaries complete with document language and in which ways beneficiaries will receive assets for easier settlement. A static plan design summary populates once the plan has been crafted. Complete with trust provisions (and even who will take care of pets or children), clients can now understand why a trust is in place or how the estate will settle. 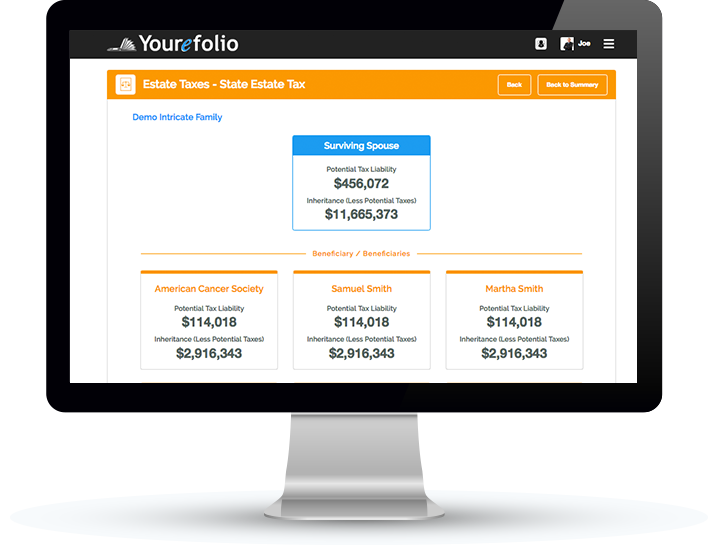 So detailed that it shows each asset, the percentage of distribution assigned and even if the individual asset may be taxable to the beneficiary. All the details in one static chart is a perfect compliment to the documents. 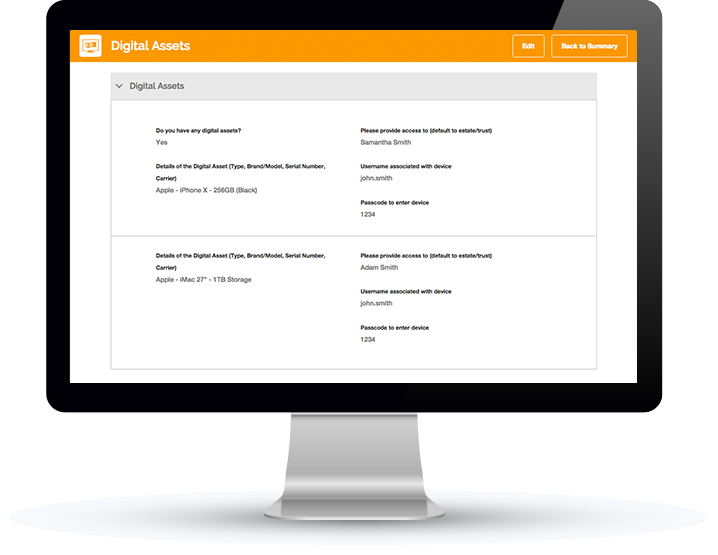 As more and more clients obtain digital assets, our digital asset repository is the perfect way for clients to inventory and plan on how those assets are to be transferred. In a technological world, more and more clients have digital assets. Understanding what they have is important, accounting for the transfer of those assets becomes easier with a proper inventory system. Our digital asset repository allows clients to add or remove these assets on their own and help you plan for their transfer. Something personal that the client doesn’t want the family to know about, no problem, they can hide those if they wish. A simple to use task manager system, synced with a customer relationship manager for easy collaboration amongst professionals and clients. Send task requests, share documents and communicate without ever leaving the system. A secure way for all of those involved in the planning to communicate about the estate while creating the best plan. All tasks sync with an internal customer relationship manager (CRM) so that notes are preserved for future reference. Need a reminder, the CRM will send out reminders so that you don’t forget to make that call or send that email. Secure communication and processing content with integrity confidentiality and privacy. Server resources are not shared; enhanced performance and security; established firewalls; constant uptime. Provides an extra layer of protection for our users. We encrypt communications between your computer and the web the same way banks do. Access authorization; data backup; hosted in a secure facility; unique user identification; automatic log off.